It's time for the Doodle Pantry March new digital stamp release. It is my first official release launch, and I'm very excited to show you what Laurie has illustrated for us this month. In addition to the new sets being offered, some of the sets in this release are actually being re-released IN COLOR. That's right...for those of you who don't like to color images, when you purchase these sets, you receive both outlined images and colored images. A lot of the sets also include digital designer papers too. I chose to use the new set Easter Star for my example. The moment I laid eyes on this set, it screamed Easter to me, and I fell in love with it. How adorable are those chicks and bunnies? Here's what I did to create this card. I printed the main image on white heavy weight card stock and colored it with Copic markers (I'm sorry I didn't write down the colors used, but I will try to make sure I do that in the future). I cut the image out by hand, leaving a very small white border. I decided I would like to mount this star on a background, so I imported the image into my Silhouette, and sized it to what I had printed out. I made an outline of the star using the Silhouette software. I removed the image, and cut the outline (I could have used a print and cut, but didn't think of it until after I had colored my image). I printed the image two more times, and cut out the little chicks in the eggs and colored those as well. I added crystal effects to the eggs to make them shiny. The flourish in the background was cut using a cut file from Silhouette and then distressed to add a little dimension. I used Hot Fix Fibers behind my focal image to represent faux Easter grass and placed the extra chicks around the star. The sentiment is also from the Easter Star set. I wanted this placed on an egg. I had purchased a set of egg cut files from Silhouette and they just happened to have one with a star in it. How perfect to go with my main image. I imported the sentiment into the Silhouette software and placed it on top of the egg and did a print and cut. I also made an outline for the egg. I sponged the egg with yellow ink and then placed another little chick from the set into the star. I mounted everything on yellow card stock and then a white card stock base. I added the tiny crystal stars at the end. They were clear, so I used my Copic marker to make them green. A new digital challenge will also begin at noon today over at the Doodle Pantry blog. The rules are simple...just use a Doodle Pantry image, not just a sentiment, and enter your card using the inlinkz button. 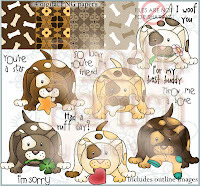 There are lots of images on Doodle Pantry's Freebie page. Just for entering the challenge, you will receive the Easter Egg Ants set free. Here is a picture of that set. Always look on Doodle Pantry's Specials page before checking out. This month, the free with purchase set is Puppy Presents. But you need to hurry, it is only free with purchase until March 24th. AND FOR 3 DAYS ONLY... A 20% OFF coupon!!!!! 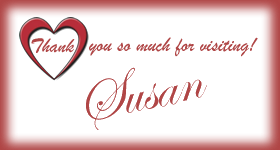 Welcome Susan - and what awesome projects you created - love the Easter Star with all the glitz, bling, coloring, and narrative. Great job and can't wait to see more. Wow, Susan, this is gorgeous. What a fabulous, fresh design; and incredible details and coloring. Love the look of the fibers behind the image... never saw or heard of them before. Beautiful work! Oh I LOVE what you did with this image. And I thought that was "real" Easter grass. Yep, I thought it was Easter grass too! What a gorgeous card!! Beautiful coloring and what wonderful details. So glad to have you on the team. I think yours is fabulous....wish I had thought of that beautiful swirl for the background...put that wonderful finishing touch. That is one adorable card! Love the star with the eggs and bunnies. Very cute set. Sigh. So bright and cheery, it makes me long for springtime. Oh well, with any luck it will be here soon enough. Easter in March? Yep, the 31st! My Italian Grandma would have hated that! (Rest her sweet soul.) I absolutely LOVE your interpretation of this Digital Stamp. Of course all the Silhouette cut and print stuff sort of blew over my head, I'm learning though! LOL Woohoo, so very happy you are a DT with Doodle Pantry. Your card, plus I saw the watering can one, well: both are gorgeous! You are such a fab artist with such an innovative eye towards each project. Makes me always say: "How'd she do dat?" LOL Well, you know me. I'm one of your biggest fans!! So CONGRATS again on the new DT position, and keep these gorgeous cards a-comin' girlfriend! Now I feel all "spring-y". LOL PS I registered, joined up, and am raring to go. Hey, a stamp I can re-size? You had me at "re-size", btw. LOL Thanks for the heads-up, love your work, or play? Yeah, play. Love it all. Good Luck with your new path...sincerely! Welcome to the team! This card is just perfect for Easter. The colors take me back to my childhood Easters and those yellow marshmallow chicks! The HFF is a great addition to the card. It looks like Easter grass. Now, if I could just convince my DH to let me get that Silhouette! LOL. 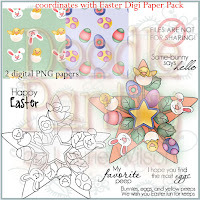 I love your Easter Star and the flourish background is gorgeous! I love how you used the little chicks and egg as embellishments! This is so pretty!! I love all the extra chicks!! After reading what you did, I realize that I can use Make the Cut and my Cricut and make mats that will fit my images! :) Thanks for sharing!